Limited number of season tickets will be made available Tuesday, May 6th at 10 a.m.
INDIANAPOLIS – Beginning Tuesday, May 6, at 10 a.m., the Indianapolis Colts will make approximately 2,000 loge level and upper level season tickets available to the public. The Colts have a new online Lucas Oil Stadium virtual venue that allows fans to see a view of the field from the available season tickets before they commit to purchasing seats. Fans can access the virtual venue and purchase their 2014 season tickets online. Season tickets can also be purchased by calling the Colts ticket sales hotline at 317-299-4946 during normal business hours. The Colts 2014 home schedule features several marquee matchups including the home opener in primetime on Monday Night Football against the Philadelphia Eagles and a Sunday night matchup against the New England Patriots in Week 11. Along with their traditional matchups against AFC South Division opponents, Houston, Jacksonville and Tennessee, the Colts will also face the Baltimore Ravens, Cincinnati Bengals, and Washington Redskins at Lucas Oil Stadium during the regular season. While flexible scheduling may be used in weeks 5-10 for the first time, it will be used in Weeks 11-17 as it has been in recent years. In Weeks 11-16, the schedule lists the games tentatively set for Sunday Night Football on NBC. Only Sunday afternoon games are eligible to be moved to Sunday night, in which case the tentatively scheduled Sunday night game would be moved to an afternoon start time. Flexible scheduling will not be applied to games airing on Thursday, Saturday or Monday nights. A flexible scheduling move would be announced at least 12 days before the game. For Week 17, the Sunday night game will be announced no later than six days prior to December 28. The schedule does not list a Sunday night game in Week 17, but an afternoon game with playoff implications will be moved to that time slot. Flexible scheduling ensures quality matchups in all Sunday time slots in those weeks and gives “surprise” teams a chance to play their way into primetime. The Indianapolis Colts today announced its 2014 regular season schedule. Along with their traditional matchups against AFC South Division opponents – Houston, Jacksonville and Tennessee – the Colts will face the AFC North and NFC East Divisions. Indianapolis will also host the New England Patriots and will travel to Denver. In total, the Colts will face four playoff teams from the 2013 season, including Cincinnati, Denver, New England and Philadelphia. Indianapolis will play in five primetime games, the most for the team since 2010. Indianapolis will open the regular season on Sunday Night Football at Denver on September 7 at 8:30 p.m. The Colts trail the Broncos 8-11 overall and 3-6 on the road in the all-time series, but have won the last five regular season matchups. In last year’s Week 7 game on Sunday Night Football, Indianapolis defeated Denver, 39-33. Quarterback Andrew Luck completed 21-of-38 passes for 228 yards and three touchdowns, while outside linebacker Robert Mathis posted 2.0 sacks and a forced fumble, which resulted in a safety. In the last trip to Denver, the Colts won by a score of 27-13 on September 26, 2010. In Week 2, the Colts will remain on primetime as they host the Philadelphia Eagles on Monday Night Football on September 15 at 8:30 p.m. Indianapolis leads the all-time series by a 10-7 mark, having won four out of the last five contests. The Colts hold a 5-2 home record in the series and won the last contest at the RCA Dome, 45-21, on November 26, 2006. In the game, wide receiver Reggie Wayne led the team with four receptions for 77 yards and a touchdown, while kicker Adam Vinatieri knocked in one field goal and six PATs for nine total points. Indianapolis will open its AFC South Division slate in Week 3 at Jacksonville on Sunday, September 21 at 1 p.m. The Colts own an 18-8 series advantage over the Jaguars, having swept the season series in 2013. In last year’s Week 4 game in Jacksonville, the Colts won 37-3 and their 34-point margin of victory was the team’s highest since October 25, 2009. Cornerback Darius Butler recorded a pick-six for the second straight season at EverBank Field. The Colts will return home in Week 4 to host the Tennessee Titans on Sunday, September 28 at 1 p.m. In last year’s meeting with the Titans at home, the Colts won 22-14 behind Vinatieri’s 16 total points. Vinatieri tied a career-high and a franchise record with five made field goals in the game. He also tied Jason Elam for the most career 100-point seasons (16) and became the second player in NFL history to score 800 points with two different teams. The Colts are 15-6 all-time at home against the Titans. Indianapolis will remain at home the following week for a matchup against the Baltimore Ravens on Sunday, October 5 at 1 p.m. The Colts hold a 7-3 advantage in the all-time series and are 4-0 at home. The last regular season home matchup came on October 12, 2008 when Indianapolis defeated Baltimore, 31-3. Wayne led both teams with eight receptions for 118 yards and a touchdown. The Colts will travel to Houston for a Thursday Night Football matchup on October 9 at 8:25 p.m. Indianapolis has won the last three contests against Houston and holds a 20-4 advantage in the all-time series, including an 8-4 record on the road. In last year’s game at Reliant Stadium, the Colts tied their sixth-largest comeback in franchise history after overcoming an 18-point deficit in the third quarter to defeat the Texans by a 27-24 margin. Wide receiver T.Y. Hilton led the team with seven receptions for 121 yards and tied a franchise single-game record with three receiving touchdowns. The Colts will then host the Cincinnati Bengals in Week 7 on Sunday, October 19 at 1 p.m. Indianapolis has lost the last two matchups against Cincinnati, including last year’s 42-28 defeat, but still owns a 16-10 record in the all-time series. In last year’s matchup, Luck completed 29-of-46 passes for 326 yards, four touchdowns and a 113.1 quarterback rating. Wide receiver Da’Rick Rogers led both teams with six receptions for 107 yards and two touchdowns, including a 69-yard score. Wide receiver LaVon Brazill also added a pair of touchdowns in the game. In Week 8, the Colts will face the Pittsburgh Steelers at Heinz Field on Sunday, October 26 at 4:25 p.m. Indianapolis trails 6-14 overall and 2-9 on the road in the all-time series with Pittsburgh. The Colts were victorious in their last trip to Heinz Field by a 24-20 margin on November 9, 2008. Wayne led the team with six catches for 114 yards and scored on a 65-yard reception. Indianapolis will play in its second Monday Night Football game of the season against the New York Giants at MetLife Stadium on November 3 at 8:30 p.m. The Colts hold an 8-6 advantage in the all-time series with the Giants, including a 6-3 mark on the road. In their last road game against the Giants in the 2006 season opener, the Colts won 26-21. Vinatieri converted 4-of-4 field goals and two PATs for 14 total points in the contest. Following a Week 10 bye week, the Colts will compete against the New England Patriots at home in their second Sunday Night Football matchup of the season on November 16 at 8:30 p.m. The game will continue an 11-year streak of facing the Patriots in the regular season or postseason dating back to 2003. Indianapolis trails 28-45 overall and 16-20 at home in the all-time series against New England. The Colts have lost the last three contests but were victorious in the Patriots’ last trip to Lucas Oil Stadium on November 15, 2009 by a score of 35-34. In the game, Wayne led the team with 10 receptions for 126 yards and two touchdowns, while Mathis added 2.0 sacks and a forced fumble. Indianapolis will remain at home to host Jacksonville on Sunday, November 23 at 1 p.m. In last season’s regular season finale against the Jaguars, the Colts won 30-10. Hilton set career highs in receptions (11) and yards (155) and recorded his first career 1,000-yard receiving season. Overall, Indianapolis is 9-4 at home against Jacksonville. The Colts will close their three-game home stand with the Washington Redskins on Sunday, November 30 at 1 p.m. Indianapolis holds a 19-10 overall and 13-3 home advantage in the all-time series with Washington. The Colts have won the last two games, including a 36-22 victory on October 22, 2006 at the RCA Dome. Wayne led both teams with seven catches for 122 yards and a 51-yard touchdown reception in that game. Indianapolis will face the Cleveland Browns on the road on Sunday, December 7 at 1 p.m. The Colts trail 13-14 in the all-time series with the Browns but are 7-5 on the road. Indianapolis has won six of the last seven contests, including most recently a 17-13 victory at home on October 21, 2012. Running back Vick Ballard led both teams with 84 rushing yards, while Luck became the third quarterback in franchise history and the first since 1988 to run for two touchdowns in a single game. The Colts will close the season series with the Texans at home on Sunday, December 14 at 1 p.m. Indianapolis remains undefeated at home (12-0) against Houston, having posted a 25-3 victory in last year’s Week 15 matchup at Lucas Oil Stadium. Mathis logged a strip-sack in the game and set franchise records for career and single-season sacks. Indianapolis will take on the Dallas Cowboys in its first trip to AT&T Stadium on Sunday, December 21 at 4:25 p.m. The Colts trail 5-9 overall and 2-5 on the road in the all-time series with the Cowboys. In the last trip to Dallas, Indianapolis fell 21-14 on November 19, 2006. Wayne led both teams in the game with seven receptions for 111 yards and one touchdown. The Colts will wrap up the regular season on the road against the Titans on Sunday, December 28 at 1 p.m. Indianapolis has won five straight games against Tennessee, having swept the season series over the last two years. The Colts hold an overall 25-13 record against the Titans, including a 10-7 mark on the road. In last season’s Thursday Night Football game at Tennessee, the Colts rallied to score 17 unanswered points in the third quarter en route to a 30-27 victory. Tight end Coby Fleener led the team in receiving and established career highs with eight receptions for 107 yards. 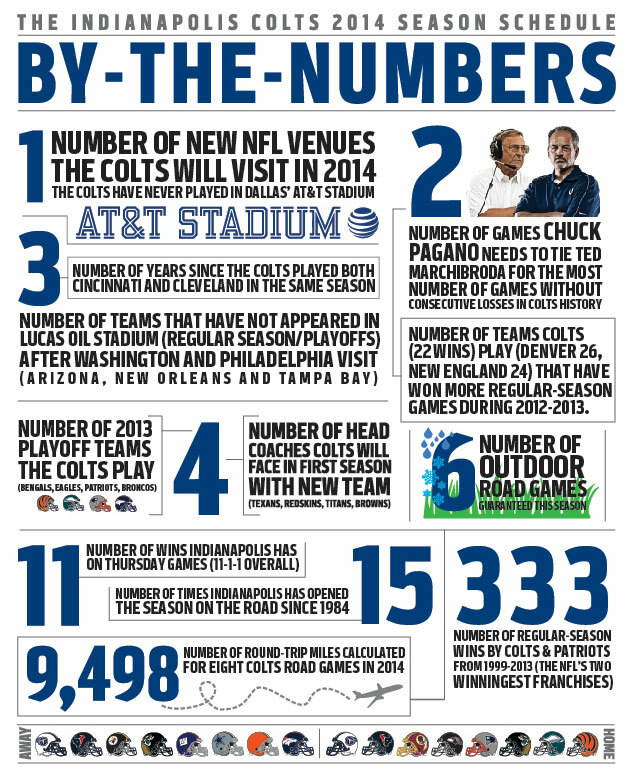 Colts’ 2013 schedule harder than it looks? Manning’s return, 4 prime time dates highlight Colts sked. Should Freeney’s 93 be back in action?